Messe Noir is from Meriden Connecticut. The band members are: Joe Giannetti (vocalist) from Natas Productions, Mike Morrill on drums, and Matthew on rhythm guitar. 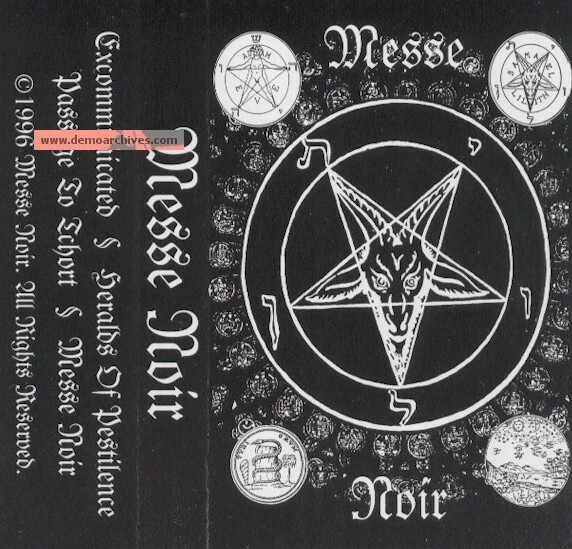 Messe Noir was officially formed in January 1995. The lyrics tell the stories and myths of the ancient Sumerian gods. 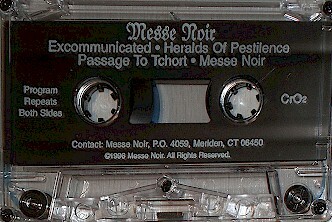 Messe Noir previously released a two track Demo that featured Excommunicated and Heralds of Pestilence. This demo was encouraged by their friends and fans. Messe Noir never intended to release these two songs as a demo, but since release in October 1995 the demo sold over 300 recordings. Their demo “ The Throne of Ninninhagal “ consists of re-recorded Excommunicated, Heralds of Pestilence and two new tracks Passage to Tchort and Messe Noir. The demo was released in the fall of 1996. This demo was distributed free at the Milwaukee Metal Fest of 1997. The demo has sold over 600 tapes throughout the world. The Throne of Ninninhagal received extraordinary reviews in various magazines across the world.